This stunning and spacious 2 bedroom, 2 1/2 bath master suite condo (1200 sq ft) provides everything you need for your vacation in paradise. 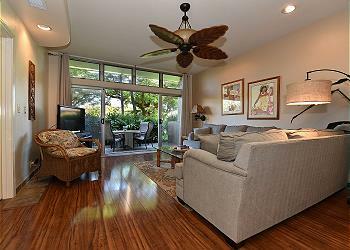 Newly renovated and fully furnished, this condo is a great deal. Equipped with air conditioning, wifi, a fully stocked kitchen and stainless steel grills outside, you can enjoy all the amenities of home while relaxing in Maui. Conveniently located only 200 steps from the water’s edge of Kaanapali Beach, you can choose to relax on the beach with spanning views of our neighbor islands, Molokai and Lanai, or head down to the resort pool - newly renovated and equipped with two hot tubs, grass shade umbrellas,’ and a child (or keiki as we say in Hawai’i) pool. You can also head down to the walk up bar and enjoy one of the best Mai Tai’s in Maui and watch the sunset! Enjoy eating poolside at Castaway Cafe. This is a casual, open-air restaurant with an indoor/outdoor bar featuring island cuisine. The resort also features 24 hour front desk, coffee/tea in common areas, free newspapers in the lobby, concierge desk, gift shops, library, ATM, porter/bellhop, fitness center and laundry facilities. Don't forget to explore Whalers Village shopping and restaurants via the free Kaanapali Trolly! You can also explore historic downtown Lahaina, located only 5-10 minutes away from the resort via bus or car. Note: The MKV Association charges a check in fee of $40 and a Resort Fee of $20/day for parking, gym, phone, internet, and HD TV. Please return both the parking permit and room keys to the front desk upon departure.